It is time for the annual Pumpkin Parade and Detective Inspector Mike Malone wants nothing more than to enjoy the fruits of the season with his family. 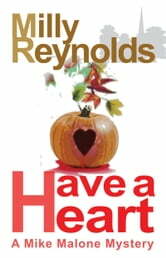 However, when one of the town&apos;s residents starts receiving unwanted and sinister gifts from a stalker, all thoughts of autumnal fun are put to one side. Together with his trusted Detective Sergeant, Alan Shepherd, Mike finds that very quickly, he has more murders on his plate than slices of pie. Another jolly good read and very interesting story. I dont know how she does it. All i can say is keep it up milly. A tangled affair for Mike Malone to unravel. And sometimes without the consolation of cake.